I can’t recall the last time I sat and cried all the way through a movie – maybe it was a love story or maybe it was a tragedy – but this time it was a documentary. What an extraordinary film. Go. See. It. Now. 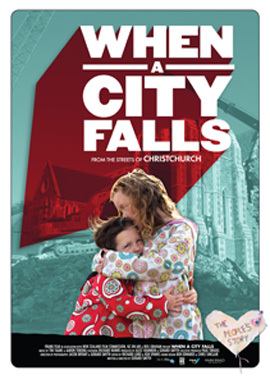 Filmed by Christchurch resident Gerard Smyth, When a City Falls is a quite remarkable documentary, of fascinating interest to engineers, architects, and kiwis alike. I’d recommend almost everyone to go and see it – except perhaps Cantabrians who were actually there. I think it honestly be all a bit too much like the real thing all over again – certainly i wish i had bought a box of tissues with me, as my eyes kept on streaming all the way through the movie. Quite, quite extraordinary. The special effects at the movie theatres nowadays are very real, and I remember seeing the Lord of the Rings films at the Embassy, with accompanying massive reverberations through the floor when those angry trolls of Mordor started to hammer away at a fleeing Frodo – so when the floor started to shake during the screening, for a brief second or two I thought that someone had developed Shake-o-Rama in order that we experience the Canterbury earthquake better. But no, it very soon became apparent that Wellington was having its very own shake – a relatively modest 5.7 over near Picton, apparently, although there has been some damage reported in Wellington. There is nothing quite as unsettling as watching a film about a city being destroyed by an earthquake, when you experience one at the same time. Synchonicity sings the Police, but I was more thinking – where is the exit door, and is the city falling down around me? After a good 20 second series of shakes, shudders and bounces, I figured that seeing as the film hadn’t stopped, neither would I, and I settled back in my comfy armchair, ready to meet my maker in a velour covered armchair, too low to the ground for me to hide under. The view from the rest of the audience was not quite so sang froid however – about a third of the audience had scarpered straight out the exit doors to safety as soon as the shaking began. It wasn’t just my nerves that were stretched to the Maximus then – as I turned around to see if anyone was staying in the theatre, I was greeted with the site of almost an entire audience wet-faced with tears. Yes, I know that a 5.7 in the Cook Strait is hardly worth waking up for, let alone getting all hot and bothered about, but when it comes a day after the Dompost screams a headline of Seismic Shock, and half the courtrooms in the county are closed down due to seismic susceptability, then it really must be starting to come home to people – we’re living on a tinder-box here. Wellington is sitting on a time bomb, primed and ready to go off, and no matter how nice the weather has been here for the last couple of days, I don’t particularly want to die for the sake of my city. It’s not just the Green Dry Cleaners building that needs a strengthen or demolish sticker – there are so many more. But that’s the thing – if we sit around staring with our fingers in our ears, we’re never going to solve this question: how will we survive the coming Big One? We could be proactive, and demolish all the old brick buildings, smash them all into rubble and have some nice shiny new prefabs in their place, like they have done in upper Cuba St. Or like they are having to do by de facto in Christchurch, where they have now demolished so much of their heritage that there really is little point in remaining in that poor, squidgy southern city of ours. We could just shrug it off and continue to ignore the facts staring us straight in the face, hold our breath, and mutter “She’ll be right, mate” in that endearingly stupid way we have of (not) coping with problems in this tinpot country of ours. Or we could be really clever, sensible, and innovative all at the same time, and instigate a publicly funded strengthening program for key buildings and key streets in the Wellington CBD. Yes, it will cost money, but it is futile to expect that the private owners will be able to / would want to pay for full strengthening on their own, just because the rest of us think their buildings are pretty. Get real ! If we like your building, and we consider it part of our – that’s OUR – townscape, then central funding has simply gotta happen. Time for some smart thinking about ways of funding this wave of much needed strengthening – let’s start right here in Wellington. “Canterbury councils have almost never considered earthquakes when approving subdivisions on liquefaction-prone land, a reports says. 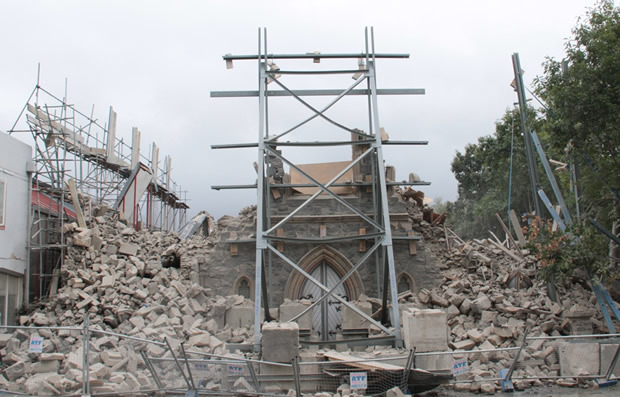 A report from resource management consultancy Enfocus to the Canterbury earthquakes royal commission says Christchurch City Council and Environment Canterbury took a passive approach to earthquake risk. The city council’s plans appeared to put a strong emphasis on the risk of earthquakes but did not translate this into demands on developers, the report said. It’s not too different from rebuilding on the banks of the flood-prone Mississippi River and buggering the consequences. An interesting line of conversation from a colleague in Christchurch, is that in his eyes, New Zealand is essentially over-insured. Evidently, in many places, such as the banks of the Mississippi, buildings may be uninsurable. Disasters are so common, or are just so waiting to happen, that insurnace companies simply refuse to give cover. That’s not the end of the world – people just need to factor that into their calculations for building / re-building. But it has one effect: demolition only proceeds if it REALLY has to. By contrast, if the money was more tied to people’s own pockets, they tend to be a whole lot more protective of the fabrics of heritage that aren’t yet destroyed. 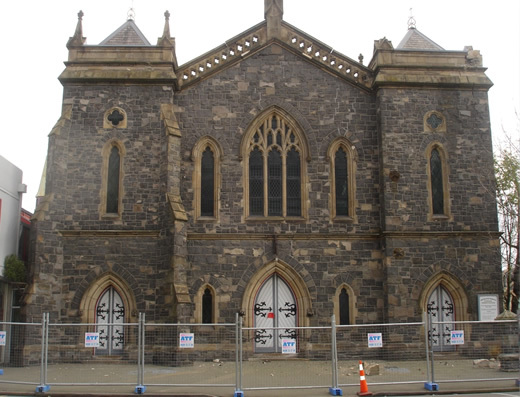 It is quite extraordinary what is happening in Christchurch – despite Brownlee saying early on that only 4-5 old Dungas might be saved, with the rest of them going on the scrap heap, it seems that even that may have been an exaggeration – demolition is proceeding on alll fronts, including the Cathedrals, the Provincial Chambers, and many more. Knock them all down – its a fire sale. Thanks Maximus as always for the thoughful post. Here’s where I think Wellington is/should be going. The good news is that Council has done a lot of work in strengthening infrastructure (reservoirs/road embankments etc). There are good relationships with key lifelines (power, telecomms etc), Council is training emergency volunteers (aim is to get 800-1000). We’ve been on the case of building strengthening for many years, and many new buildings are built with earthquakes in mind (eg our Stadium, Te Papa) or old ones retrofitted (Parliament, Old Government Buildings). We’ve strengthened several of our CBD buildings, are well into strengthening the Council housing stock, and have brought forward the Town Hall/ Municipal Office Building (MOB). What should be happening soon is publicity material to explain what has been done, what still remains to do (still a lot !) and what private owners can do to help themselves. Buildings is a key issue. I agree with you that public help is appropriate and required where a building has public value. For example we should identify the most important heritage buildings or groups of heritage buildings that Wellington would be immeasurably poorer for losing, and help the owners to strengthen those buildings, so not just the occupants / passers by survive a quake, but the buildings themselves are also salvable. Just looking at the tragedy of Christchurch, it’s just had it’s identity ripped apart. Government and Councils need to help with this. To those who say it costs too much – so does not doing anything. Again in Christchurch we (through the Government, EQC, and increased insurance costs are paying a fortune to replace destroyed buildings after the fact. Wellington will have an earthquake one day – we’d be better off (cheaper and less disruption to the very existance of a city) saving buildings before the fact. Buildings which have heritage value but are not so critical to our sense of place we should require to be strenghtened to avoid collapses causing loss of life. There will be demolish/retain decisions and again public support may be required. What about buildings without such (heritage) values ? A number of people are saying that owners cannot afford to strengthen. 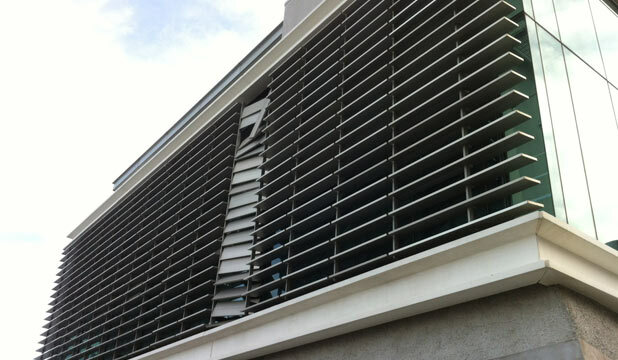 The Council’s current policy gives 10-20 years to do the work depending on the use of the building. Those timeframes are probably too long. The other key issues about affordability is that there is a huge cost in not strengthening. Getting insurance, therefore getting a mortgage, and finding a buyer if you want to sell, or a tenant who’s willing to pay a price, are all going to be much harder for higher risk buildings. There remains much to do and some important decisions to make as a community. We have made a submission to the Royal Commission investigating the Canterbury earthquakes, and will make further submissions in due course as the inquiry progresses. Its findings will undoubtedly affect future decision making. One thing is certain, as you say ‘she’ll be right’ will not cut the mustard. The discussion is healthy, and necessary. We so not want to forget what happens when a city falls. Wellington.scoop.co.nz » Did you feel the earthquake? Thank you Councilor Foster – hugely helpful commentary. Interesting response Andy – great to see some informed comment! In my uninformed opinion, I see some rather important issues with respect to the use of terms such as “heritage”, “public value”, and “sense of place”, in an almost interchangeable manner. I think we need to define what we mean by these things a little more accurately so that a more productive debate can be had.